Cartridges and More can help you with: Copier Toner, Thermal Fax Film, Printer Ribbons, Ink and Laser Photo Paper, other papers and reribboning and reinking of ribbons. The only UP organization that repairs inkjet printers, and repairs printers, copiers and faxes. On site printer delivery, repair, and maintenance is offered to business customers. 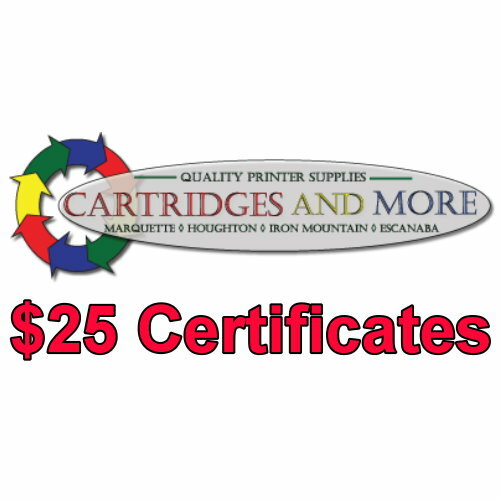 Cartridges and More - the U.P.s premier supplier of alternative Printing Consumables and Dependable Printing and Copying Systems. Cartridges and More offers remanufactured and aftermarket laser jet and ink jet printer cartridges at discount prices to save you up to 40% on select cartridges. Cartridges and More also sells new OKIDATA and TOSHIBA along with a variety of used printers!